An annual toy drive pays tribute to the memory of an unforgettable boy. >>> our "making a difference" report tonight is the story of a boy who knew all too well how hard it is for a kid to be sick at christmastime and wanted to make sure other kids going through what he did were remembered during the holidays. "making a difference" in the true christmas spirit , kevin tibbles has our report from chicago tonight . >> reporter: chicago and cold! it's like the north pole and these are elves. >> reporter: yet, on this day they're not here for santa, but for a boy naked mark. >> he had a compassion and a love for people like i've never seen in my life. >> reporter: mark stayly spent six years in and out of chicago 's children's hospital battling cancer and he knew all too well no child wants to be sick, ever, let alone at christmas. 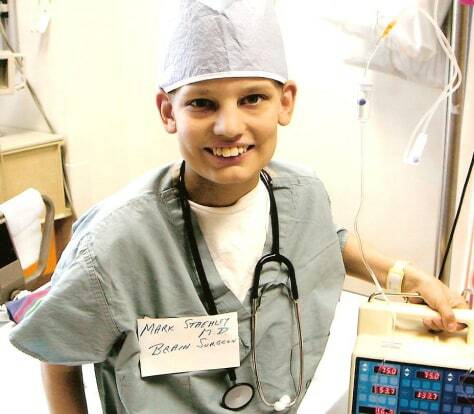 so ten years ago with help from family and friends mark started a toy drive, handing out toys to fellow patients. when he died in 2006 , he made his mom, sue, promise to carry on. >> we hand out hope. >> reporter: from 150 toys a decade ago to more than 30,000 this year! >> mark would love this. >> reporter: all donated and then sorted at the new firehouse in mark's hometown of sherwood, illinois. >> this is all from the generosity of a little boy that thought of others. when we see the babies' faces it makes up for all the hard work we do. >> reporter: the toys are hand-delivered with love at children's and two other hospitals. >> oh, yeah, that's what i want. >> reporter: this 6-year-old connor is awaiting a bone marrow transplant. >> what did you get? >> reporter: this 9-year-old has krohn's disease. >> his eyes got huge. very huge. >> whenever i see a kid smile i know mark's with us and mission accomplished . >> reporter: and what does sue think mark would say about all this? >> he'd be like, yeah, she's doing what i asked her to do and she kept her promise to me. >> reporter: from a boy's whose own spirit couldn't be broken, the spirit of christmas lives on. >> reporter: kevin tibbles, nbc news, chicago . >>> there's more on the story on our new "making a difference" website. you'll see a link that takes you right there on our website nightly@msnbc.com.